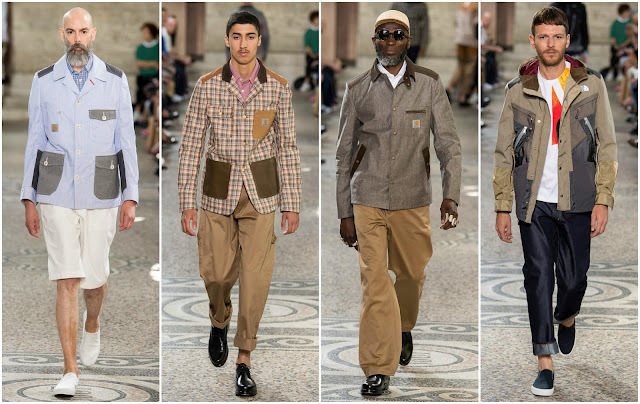 Junya Watanabe has rightfully faced a reproach for his misrepresentation of men with his abysmal casting at his Paris Fashion Week shows. Season after season, there was a sea of white models, only one or two models among them, which undoubtedly doesn’t reflect the nature of the world, or even the city he’s showing in—a melting pot of ethnicities and races. 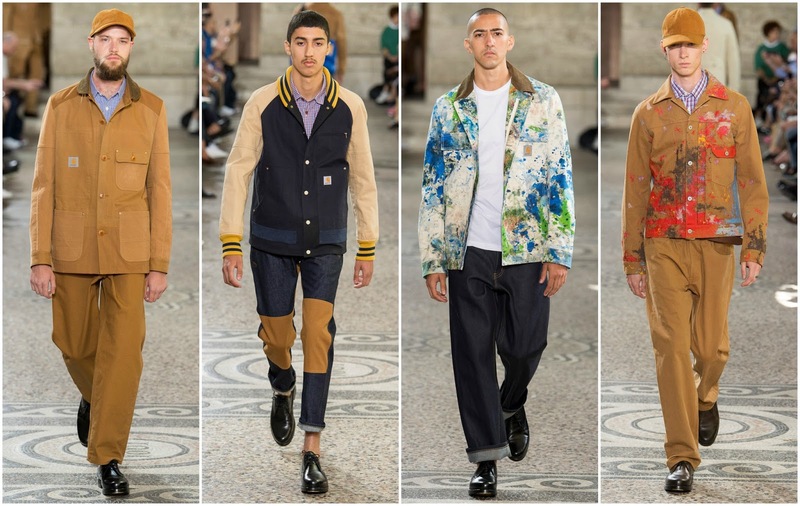 He rectified that issue for Spring 2018 menswear with a more inclusive cast, both in age and ethnicity. It enhanced the flow of the collection; convincingly, this could’ve been any street in the world, the characters materialising from one end of the runway to take the runway in various iterations of modern day workwear. Workwear and the street are two cornerstones to Watanabe’s menswear. Far more perfunctory and in line with necessity than his conceptual womenswear, the clothing preoccupies itself with broadening the modern man’s horizons, enriching the varsity jacket with unconventional fabrication, cutting trousers to the calf or ankle, structuring blazers and jeans using patchwork methodology. It projects how integral craft is to the process at Junya Watanabe. The dialogue he opens with the customer is further developed with collaborations with The North Face, Carhartt, Levi’s and Karrimor. The effect of partnering with these instantly recognisable brands is that it opens Watanabe to a new audience but it also cements the brand’s message which, based on the nature of his collaborations, is to create sturdy apparel suitable for working conditions and also leisure activities. The emphasis this season was placed on the workwear element of things in a more literal sense of the word. There wasn’t only garments that could be adapted to the wardrobe of workers but an insight into who they might be. For example, some jackets and trousers were splattered with paint, as if the artist had emerged from his studio after a day of painting. Tapping into artistic types seems to be Watanabe’s goal; his clothing isn’t entirely straightforward—sure, he has brilliant trousers and fantastic jackets but they aren’t traditional, the silhouette or the level of craftsmanship. And although one may consider it wrong to stereotype the men on the runway, generally many of them look as though they hail from creative backgrounds—they complete the ‘hipster workman’ aesthetic Watanabe has carved in recent seasons. This season, there was an inherent lightness to proceedings; it was show that conformed to the softness of the summer season. This kind of nouveau dandyism is fantastic, he’s one of—if not the only—to have mastered this aesthetic without it veering into comical territory. As odious and pretentious as one may perceive hipster culture to be, Watanabe’s rendition is arguably approachable and accessible and he does it with aplomb.